Check this page for more information or send an email to sara@portoalities.com. There are literally dozens of markets in Porto. They are great places to kick start your vacations in Porto, or simply to look for an original and affordable souvenir to take back home. Porto Belo is probably the most popular market in Porto. No wonder! It has a superb location, between the romantic neighbourhood of Cedofeita and the nightlife district of Porto, and close enough to main city attractions such as the Lello bookshop and the Clérigos tower. It’s also close to some of the best boutique hotels in Porto. 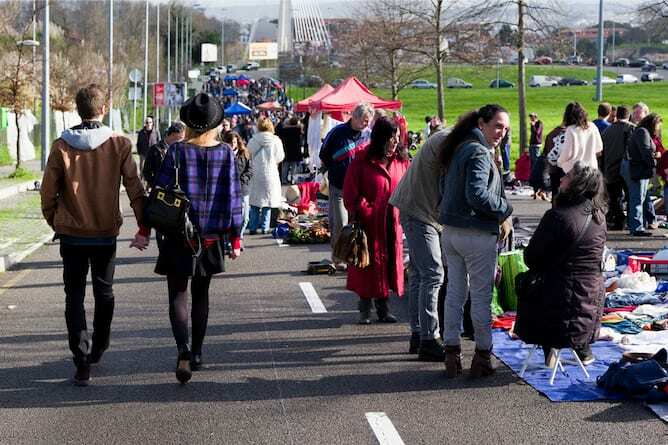 You can find pretty much anything at this Saturday – afternoon – market, from vinyl records, vintage clothing and accessories, antique cameras and film material, stamps and coins, illustrations. 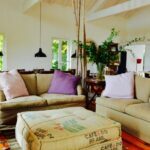 But if you’re not so much into antique stuff do not worry, as Porto Belo is also a great place to find design pieces and organic products like olive oil, teas and jams. If you’ve just been dragged by your better half into this market, worry not: there’s good music, an inviting puff and plenty of sun to enjoy while you wait! How to get there: São Bento train station, which also has a subway connection, is 10min walking distance. 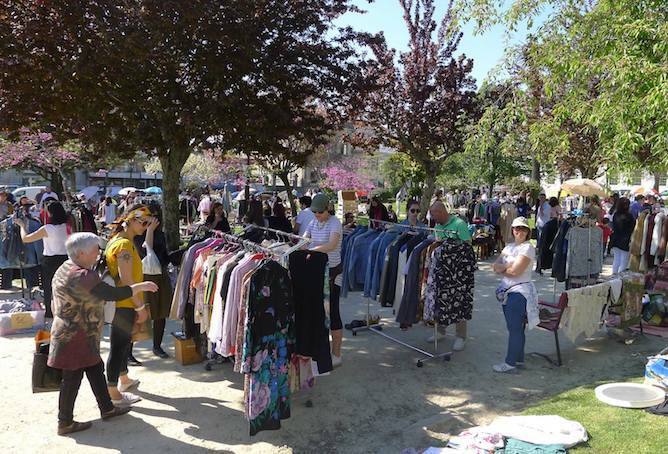 The clérigos market takes place every second and last Saturday of every month, from 10am to 8pm. 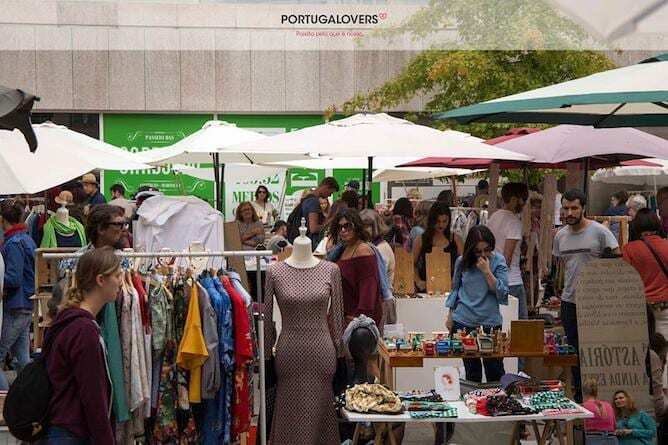 Therefore, this is a great market to find modern souvenirs and stuff to wear / decorate your home, but not the place to find typical souvenirs from Portugal. 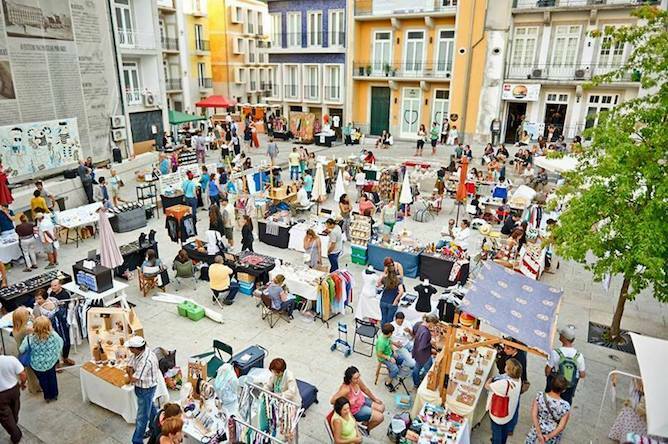 Usually the Urban Market takes place either at Praça das Cardosas (first picture) or at the Hard Club (second picture). If it takes place at Praça das Cardosas then it’s an open air market, which is great during sunny (or at least non rainy) days, as you can take a seat on the esplanade. 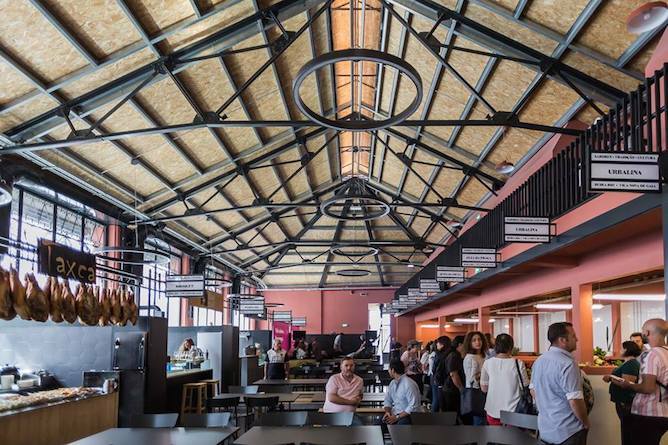 If it takes Place at the Hard Club, you’ll be safe from the rain under the roof of the magnificent Ferreira Borges’ market. How to get there: It depends, as the Urban Market takes place in different locations. 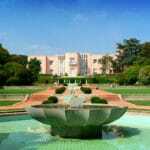 If it is located at Praça das Cardosas, you just need to go to São Bento train station, right across the street. If it takes place at the Hard Club, you must also get to São Bento and then walk down Rua Mouzinho da Silveira. 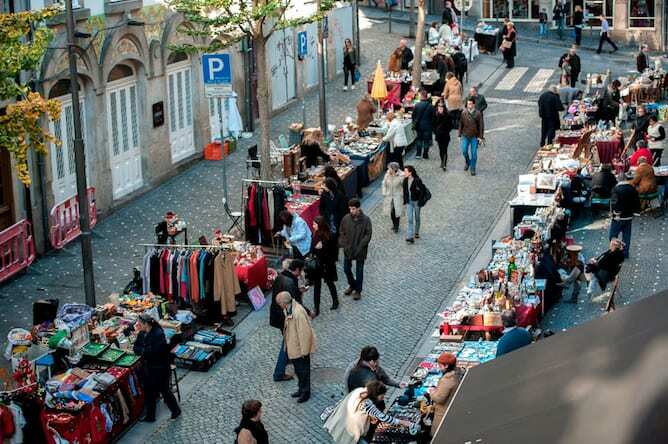 Feira da Vandoma is one of the oldest markets in Porto as it started many decades years ago by the hands of students who used to sell their old books. 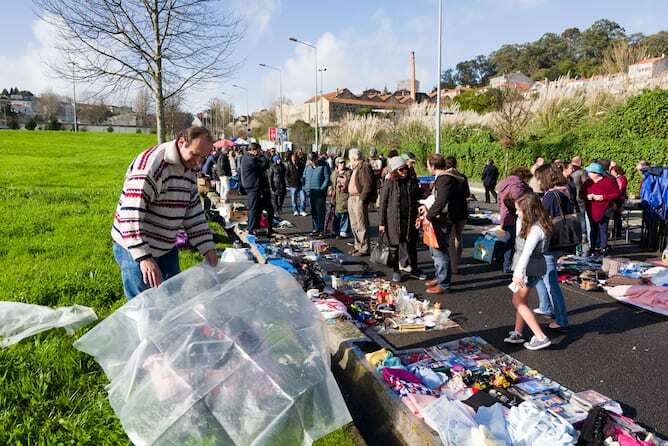 This traditional second hand market of Porto is held every week on Saturdays, from 8am to 1pm. There, you can only find second hand objects such as clothes, dishes, furniture and decorative items, discs, books, electrical and / or electronics (I cannot promise they are in good shape! :P), household and working utensils. How to get there: It is 10min walking distance from the subway station Estádio do Dragão. Local tip: There are two very touristic markets that take place in Ribeira, in Porto, as well as in Cais de Gaia, in front of where most Port wine cellars are. I don’t particularly like those markets in Porto as they mostly sell the so called “traditional Portuguese souvenirs”, such as printed tiles’ napkins (! ), fado shawls (seriously people, no one wears those anymore! ), and cloth sardines (aaaaargh, the tourists’ obsession with sardines!). The only good thing about these markets is that they sell lots of little things in cork, which are cheap, light and work perfectly as a souvenir. 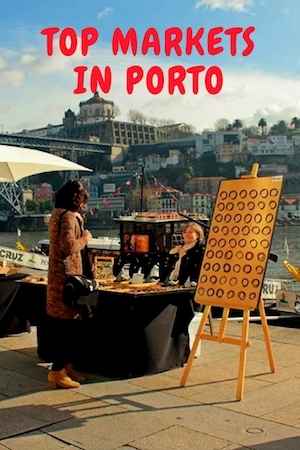 If you are looking for something rather unusual and very typical from Porto, I suggest you to try the Birds Market, which takes place every Sunday from 7am to 1pm. The name of this market in Porto says it all: it’s literally an open air fair where you can find all kinds of birds that are there for sale. There are parakeets, canaries, ducks, roosters from Japan, mandarins … all kinds of winged animals, and some without them, for there are also rabbits, fish and even crickets. 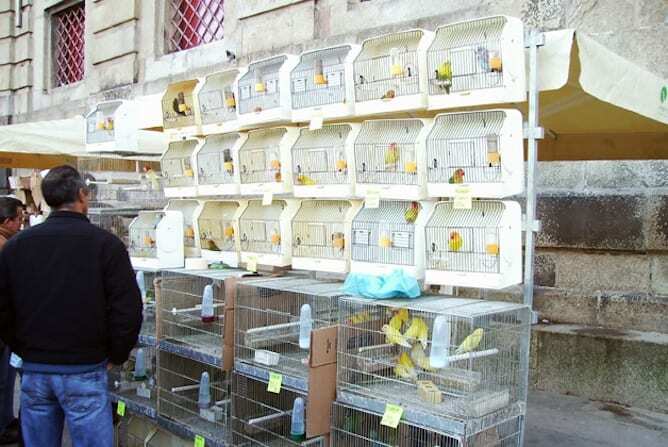 There are also cages and accessories, vegetables, and bags of food for sale. Moreover, the view from this market is simply breath taking! Note: if you are very sensitive to animals’ conditions you might not want to go to this market. Don’t get me wrong – the animals are all well taken care of and you can see that the people that go there really care about them. But it’s still dozens and dozens of birds inside the same cage! How to get there: It is 10min walking distance from the subway station Campo 24 Agosto. I have held the flea market of Porto very close to my heart ever since during my student days I spent my Saturday afternoons there selling my old stuff. I would spend hours in my parents’ garage, digging some saleable objects, that I would clean up, load in the car and then cheerfully sell on the flea market. Nowadays, I like to go to the flea market as it is one of the best markets in Porto to find antiques, vintage clothing, vinyls and tons of homemade sweets (true story!). 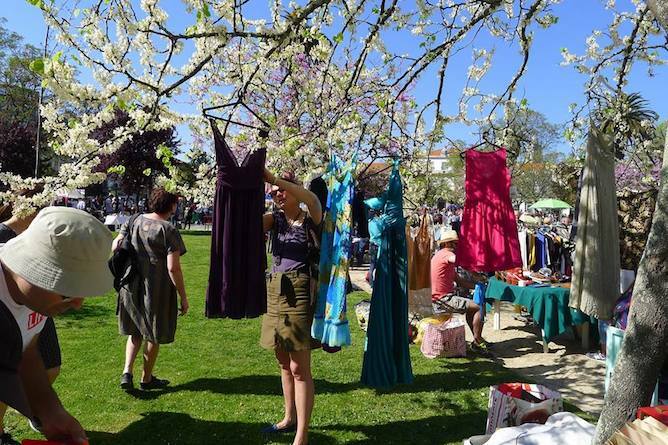 How to get there: It depends each time, as the flea market takes place in different locations every time! My father used to collect old stamps, and now that I am growing older I can see the magic beyond those beautiful pieces of illustrated paper that can capture so much of the essence of a country, a region or a particular product. 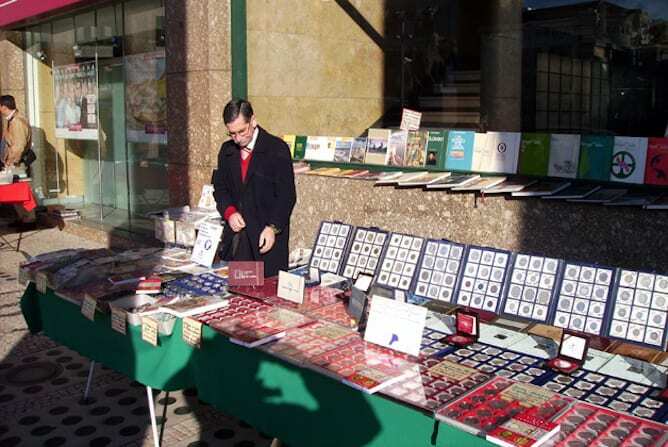 Therefore, once and a while I visit the numismatic, philately and collecting fair of Porto, where you can find mostly stamps, old coins and ancient medals, all in excellent conditions. People over there, both vendors, buyers and voyeurs are truly passionate about what they are doing, which makes this one of the most engaging markets of Porto. How to get there: The subway station Bolhão, Aliados and São Bento are all 5/10 min walking distance. 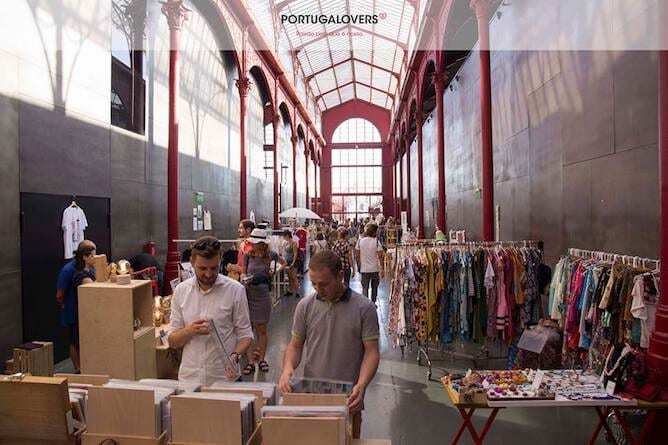 Local tip: Besides this beautiful outdoors markets in Porto, there is also the magnificent Bolhão’s market. 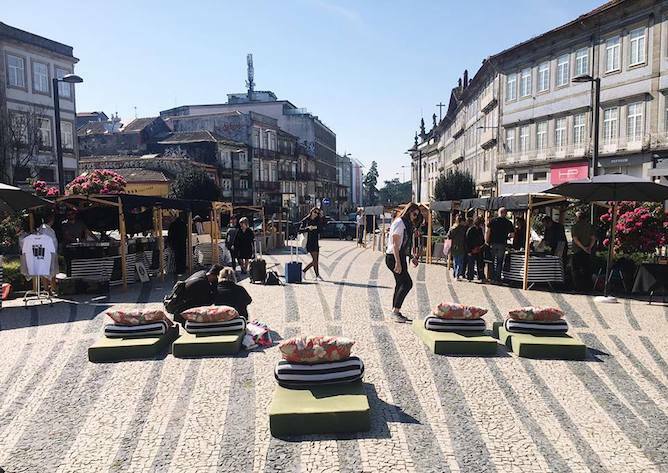 This is the last “fresh” market in Porto, where you can find not only fresh vegetables and fruits from nearby farms, but also delicacies such as home baked bread, Portuguese sausages and cheese. What about food markets in Porto? In Porto we don’t have those mouth watering food markets like you see in Madrid and in Barcelona. Nonetheless, we do have two places that used to be real markets that were renovated – now they both have many little food stores where you can have a meal. 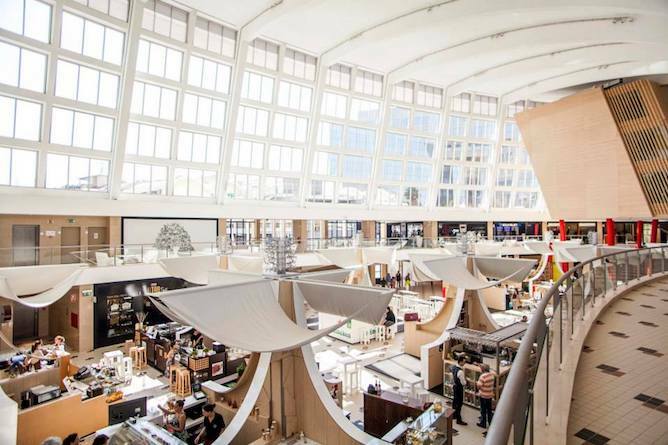 This huge market is by far the most beautiful one, as it has a beautiful natural light and plenty of space. It has many different food stores, so it’s perfect if you’re traveling with a group of friends and you cannot agree about where to have dinner! At Mercado do Bom Sucesso you have pizzas, sushi, suckling pig, risottos, vegetarian and tapas like, just to name a few. There are also plenty of places to get a cocktail or a decent cup of wine, so it might be also a good option to have a drink after dinner. This food market is very close to both Casa da Música and the synagogue of Porto, so it might be a strategic place to have lunch if you’re planning to visit these monuments. How to get there: the subway station Casa da Música is 10min walking distance. This food market in Gaia is rather small and dark, which makes me feel a bit anxious, so I don’t go there very often. On the other hand it has some really nice restaurants, such as Barriga Negra (amazing traditional petiscos!). 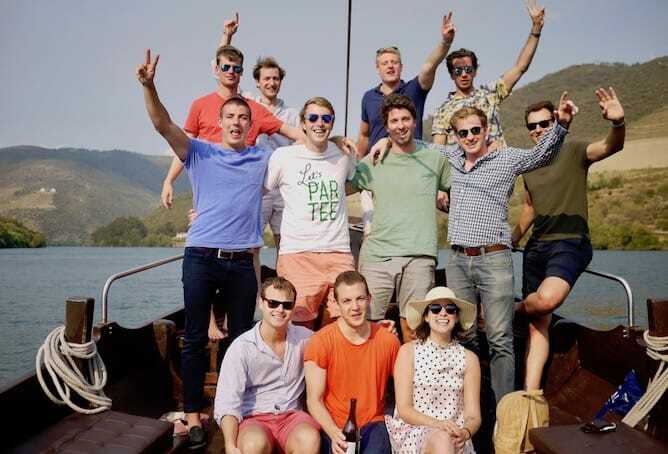 Another great advantage of this market is that it’s very close to some of the best Port wine lodges, so it’s a great place to have a bit after you’ve taken a wine tour. How to get there: the cable car is right in front of this food market. Otherwise just take an Uber / taxi. 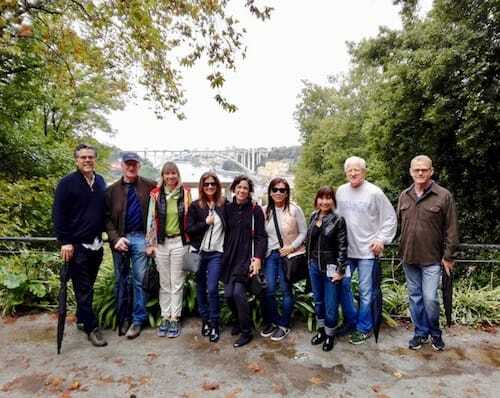 The best way to get to know Porto is to go on a private tour with me! 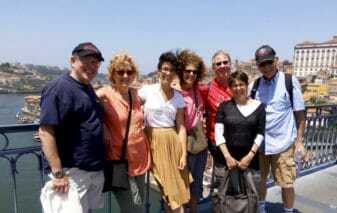 Check this page to learn more about my tours in Porto, or simply send an email to sara@portoalities.com. 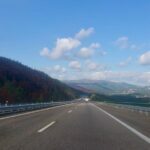 I will shortly get back to you with a tailor made tour designed specifically for you. It will be a pleasure to welcome you in Porto! 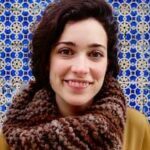 A former Industrial Engineer, Sara quickly left Excel formulas to follow her true passion: writing and telling stories. Nowadays, she writes on Portoalities, and makes private tours in Porto and Northern Portugal. 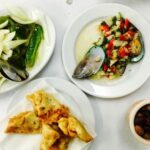 What are the best restaurants in Porto for a low budget? Why risk it - book your hotel ahead! Looking for something fun to do in Porto?